Bonding over a mutual love for Disney, Bri and Nhi celebrated "I DO" with a magical wedding that beautifully honored their unique love story. Bri and Nhi met in college, "We lived on the same floor and just became friends from the very first day. We hung out basically every day, and everything else is history." A few years later the two got engaged, surrounded by close friends, in front of Sleeping Beauty Castle in Disneyland. "Since we got engaged in Disney we thought that it would be fitting to also get married there, why not right?!" Bri and Nhi chose to incorporate 'It's A Small World" theme throughout their wedding, "Since we are both from different countries and love traveling together." From the custom place cards and table names to the stunning wedding cake, every detail of their special day celebrated their love story and their two unique cultures and heritage. 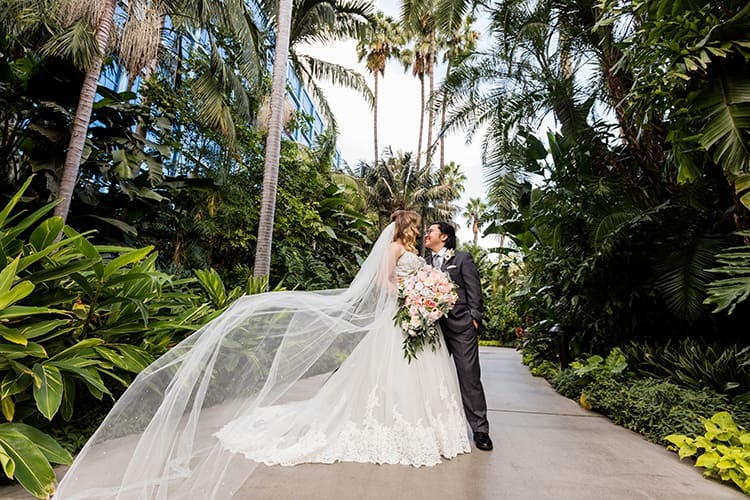 "Disney’s Fairy Tale Wedding was able to help us make a very magical and memorable event and everything went so smoothly. It was perfect." We asked them what advice they would share with future couples, and they shared, "Enjoy every moment of the day. Time goes by really fast. Soak in all that Disney magic because really nothing else compares to how magical it is, and you truly feel like a princess."